Beverly Hills, pop. 34,000, is 8 miles west of downtown Los Angeles. It is possible to completely ignore a Beverly Hills ticket ! 1. The Los Angeles County Superior Court does not report ignored red light camera tickets to the DMV. More info is in "Countywide Information," which is Docs Set # 2 on the LA County Documents page. Yes, this is the webpage with a LOT of info about tickets from the red light cameras in Beverly Hills. 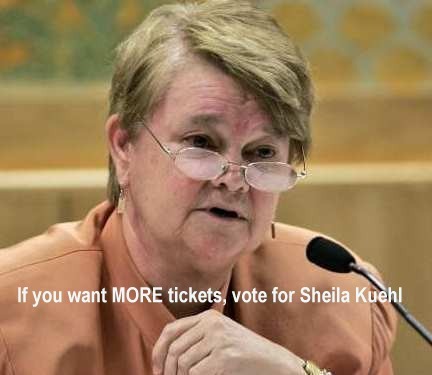 Zev "termed out," and in the Nov. 4, 2014 election, Sheila Kuehl won the race to succeed him, by a narrow margin. Kuehl may be up for re-election in 2022. 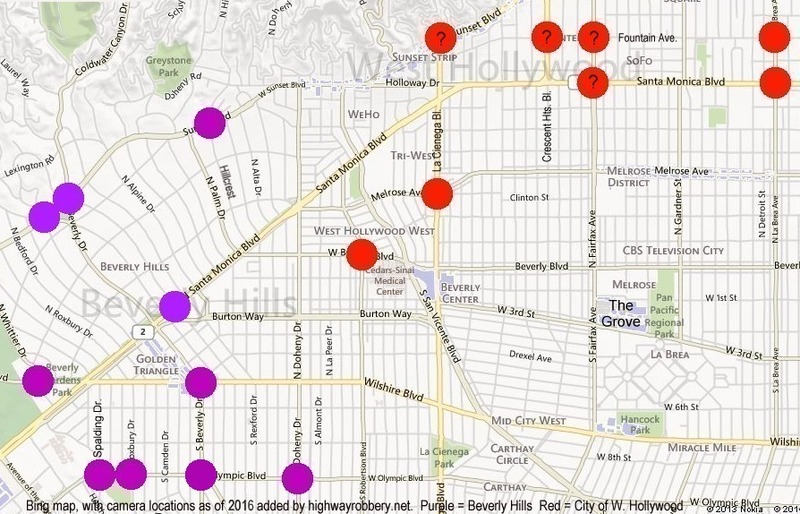 It's rare for a city's local paper to be critical of a city's actions, but on May 22, 2015 the Beverly Hills Courier described the City as having "a sour reputation as a red-light camera speed trap...."
Map includes New Beverly Hills Cameras Installed in June 2015 and May 2016, and the cameras in West Hollywood. 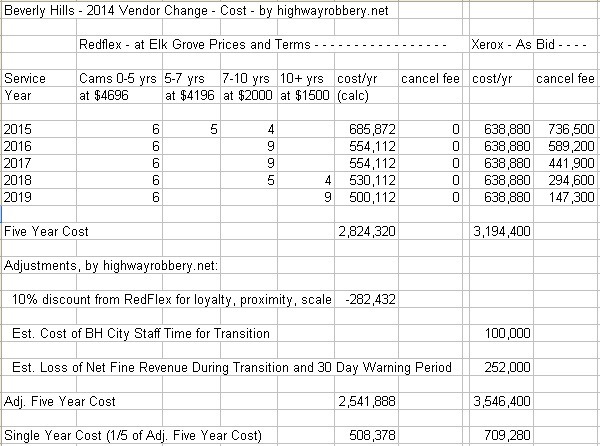 This table made by highwayrobbery.net, using official reports obtained from the City. ( ) indicates a footnote. (1) Annual total, provided by City. (2) These annual totals or projections are by highwayrobbery.net. Projections are based upon the data shown in the table above. (3) Un-used columns are to allow for later expansion of City's system. (4) Monthly average for the year indicated. (5) From the Monthly Traffic Reports filed with the City's Traffic and Parking Commission, available at the City's website. These figures appear to include warning tickets. (6) Monthly camera-by-camera data was requested on (date). (7) For the Xerox cameras beginning in 2015, the top number, in red, is "Events," the second number (not having a suffix) is "Possible Violations," and the last figure is "Violations Mailed" (not including warnings). In each Xerox camera's early months, TS=test shots, W=warning letters issued. the court, a.k.a. Snitch Tickets). of enforcement (north, south, east, west, thru, left, right) shown here may be incorrect..
(10) The direction of enforcement shown for the Xerox cameras (north, south, east, west) shown here is believed to be correct. at one of the links just below the table. (12) Data for this month has not yet been requested. (13) Listen to the YouTube video about Wilshire/Whittier, in Set # 4, below. (14) New cameras started June 2015 - See Set # 3, below. (15) New cameras started in May 2016 - See Set # 7, below. (16) Coldwater Canyon connects to Beverly Drive, then to this intersection. (17) For more info about monthly revenue, see Set # 5, below. using 2014 proportions. Also see Set # 6, below. (19) If you have a ticket from this camera, see Set # 7, below, and please email us. (20) Per the official reports (linked above) cameras 6093 and 6094 operated for only eight days in April 2018 and nine days in May 2018. (21) Monthly camera-by-camera data was requested on (date). 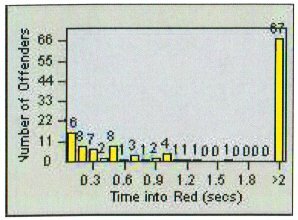 During the time RedFlex operated the City's cameras, the City provided bar graphs of Late Times, etc., for each of its cameras. The RedFlex graphs - entitled RedFlex Redlight Offender Statistics (RROS) - tracked violations recorded, not tickets issued. The picture above is a RROS example from another city. Bar graphs, or the equivalent, are available for more than fifty other cities - see the list in the expanded version of Defect # 9. "Reports discussing, tabulating or listing Late Times (or, Time into Red, or number of seconds of red traffic signal, or the egregiousness) of the Possible Violations and/or Violations Mailed in each and/or any of the months, or any other time period, May 2016 to the present." "The City's contract with Xerox [now Conduent] says (at 3(o) of Exhibit B): 'Vendor shall maintain a database... with the following information... ii. Number of seconds of red traffic signal.'" "If the City still has no responsive reports, please instead provide a digital copy of the red light camera ticket database, excluding photos or personal information about the driver but not excluding the zip code that the ticket was sent to and not excluding the age or birth year of the person cited." "These reports will be provided at a later date." Since then there have been multiple put offs. On Feb. 14, 2019 we wrote to the city council. In Sept. 2012 the City extended the 2007 contract to Oct. 2013. The City did not negotiate a lower price, so paid approx. $277,000 too much for the year. See FAQ # 17. The report submitted for the extension revealed that they made a net profit of nearly $1 million during the previous year. Invoices received in July 2013 showed (and again in July 2014) show that the City continued to pay $5870 per camera, per month. In Aug. 2013 the city manager extended the contract to Oct. 14, 2014. The selection of Xerox/ACS over RedFlex supposedly was due to Xerox' bid ($638,880 per year) being lower than RedFlex' ($792,000). The new contract says that the City will pay Xerox $3694 per month for each of the cameras the company will install at the locations formerly covered by RedFlex cameras. Strangely, the City put the contract out to bid without first making an attempt to negotiate with RedFlex. Had they negotiated with RedFlex they should have been able to obtain the same pricing as that negotiated by another RedFlex client, Elk Grove, California, whose March 2014 contract for its five camera system includes this pricing table. A complete copy of the Elk Grove contract is available on the Elk Grove Docs page. Did RedFlex accidentally run over the Beverly Hills city hall mascot, or something? Just looking at the rent over five years, without the adjustments highwayrobbery.net suggests for loyalty, etc. and the cost of the transition, RedFlex would have been cheaper by $370,080. And with Xerox the City has taken on a large cancellation fee while the typical RedFlex renewal contract - like Elk Grove's - allows cancellation with no fee. To cover the $370,080 extra rent, Beverly Hills will need to issue an extra 4112 tickets (the City's fine revenue averaged $90 for each ticket it issued, in 2013). A Jan. 20, 2015 Beverly Hills Courier article said that the Xerox cameras would be in operation by mid-February 2015. A later article said that operation would begin in June - and it did. That additional four-month delay in re-starting the cameras brought highwayrobbery.net's estimate of the revenue lost during the transition to $800,000. On May 3, 2016 the 30-day warning period began for new cameras at Olympic and Beverly Drive. See Set # 7 below for more about the heavy ticketing by those new cameras. This list of contracts and amendments may not be up-to-date - there could be a contract or amendment later than the one listed above. In Oct. 2013 Channel 4 KNBC did a story about Jay Beeber's report on the short yellow at Wilshire and Whittier and its effect on the number of tickets. On Feb. 3, 2014 Channel 5 KTLA did an interview with Beeber. The rightmost column in the Set # 1 table, above, shows the monthly red light camera ticket fine revenue the City has received from the court. The Revenue Spreadsheet on the LA County Docs page shows the revenue received by all red light camera cities in LA County. occurred at each intersection prior to and after the installation of the camera. SB 1303 was codified as CVC 21455.5(i). the right turn figures given for those three years in the Set # 1 table above are our estimates, using 2014 proportions. following information... iii. Type of violation (such as right turn, left turn, or straight through)." I periodically request the City's camera-by-camera ticketing totals and publish them on my website highwayrobbery (dot) net. Is anything being done to fix that situation? Are you prosecuting those tickets, or dismissing/refunding them? opportunity to dispute them in a court of law. Thank you again for your inquiry." westbound cars at that intersection produced just 3% of all the tickets. that intersection will be $3.3 million. I wrote to the BHPD about this, without success - see the thread [above]. of May, June and July 2018 (those reports are at links in Set # 1, above) showed that ticketing at the intersection was way down. On Feb. 14, 2019 we received the ticketing reports for Aug. - Dec. 2018, which showed that ticketing in December 2018 was three times the rate in July - Oct. 2018. Later that day (Feb. 14) we emailed the city council about the jump in ticketing. "Based upon review of accident data, the average collision rate is equal to the statewide average for comparable intersections." We don't yet know just when the contract work was carried out, but it is possible that it brought the (temporary) reduction in ticketing which became visible in April 2018.
the fines so unfairly imposed at eastbound Olympic/Beverly. There may be some more Beverly Hills information posted soon. Mark your calendar to remind you to come back here and look!